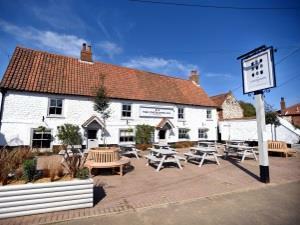 The Chequers Inn01485512229work Small HotelSet beside the All Saints church in Thornham village, The Chequers Inn, hotel, restaurant and bar, has been transformed into a stylish coastal hideaway. Inside you will find a traditional bar with a warm country feel, a vast open fire and low beamed ceiling. A contemporary restaurant and charming courtyard with fabulous cedar wood pavilions for private dining. In the kitchen Head Chef, Shayne Wood, serves irresistible seasonal menus that champion local produce, choose from a la carte, Norfolk tapas or our homemade pizza menus. The Chequers boasts 11 luxurious and individual bedrooms which are bustling with character and original features. Set beside the All Saints church in Thornham village, The Chequers Inn, hotel, restaurant and bar, has been transformed into a stylish coastal hideaway. Inside you will find a traditional bar with a warm country feel, a vast open fire and low beamed ceiling. A contemporary restaurant and charming courtyard with fabulous cedar wood pavilions for private dining. In the kitchen Head Chef, Shayne Wood, serves irresistible seasonal menus that champion local produce, choose from a la carte, Norfolk tapas or our homemade pizza menus.